Once a few technical kinks are out of Oovoo, it’ll be hard to convince most people to travel for business. That’s because you can video conference – gratis – with up to six people; exchange files, text message during the call, and lots more. And rumor has it that Oovoo will soon go mobile. 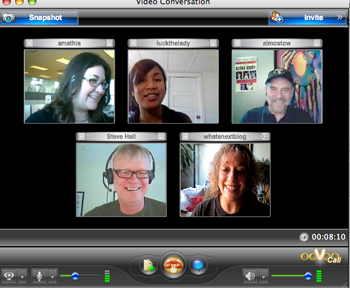 I have had video conversations on Oovoo this week with old and new friends including Susan Reynolds, Connie Reece, Steve Hall, Chris Brogan, Bob Garfield, Yang-Mai Ooi and many more. Depending on how good one’s lighting is, one looks great or ghoulish. Technical issues have mostly to do with sound, including echoes and some feedback, but I’m sure they will be worked out soon. You can bet that there’ll be a market for good lighting for people participating in online video conferencing like Oovoo, Seesmic and Skype. If you have devised a great lighting set-up please let me know. I have only managed to light one half of my face so far. All you need to participate in Oovoo and its various competitors is a Mac with a built-in camera, or a webcam and a headset. The downside to all is that one must download software. That’s a problem for many would-be corporate participants, who have to deal with firewalls on corporate servers. But that problem is surmountable as the technology becomes more accepted and widespread, and imperfections in sound and image are ironed out. You can still sign up to take part in the My Oovoo Day conversation. That’s the clever launch created by Crayon. There is no Mac version available on the ooVoo website, and the link to the beta files ultimately returns a “file not found” message. Too bad as it looked as though it would have been an answer tommy needs. ooVoo has proved to be very useful for me the day when I installed in my system. Now that you have mentioned lighting issues for conferencing, i did not experience it yet since I am using ooVoo in the office, but will keep that in mind for the future.